By Marnie Craycroft Filed Under: Montessori, Montessori in the Home, Positive Parenting Tagged With: Parenting, Peace, Practical Life This post may contain affiliate links. Please read my disclosure for more info. How do we teach kids about peace? 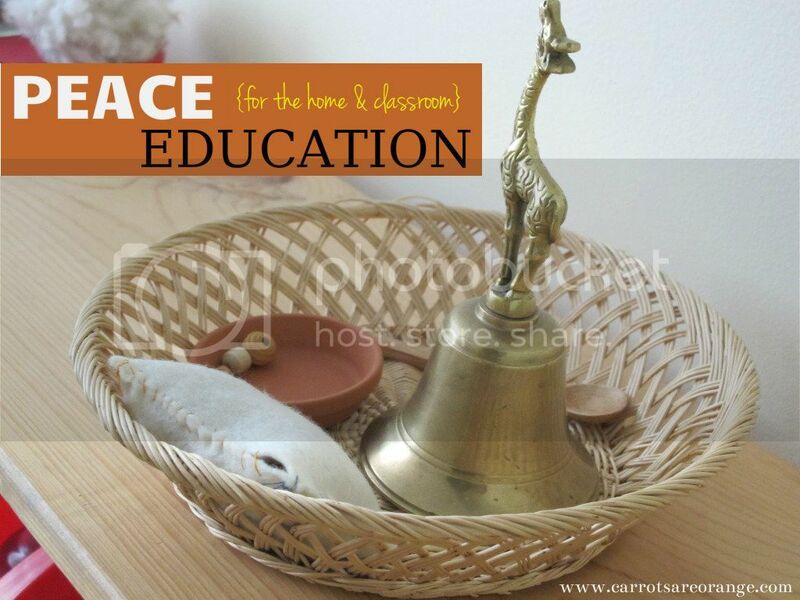 Peace education is something Dr. Montessori took seriously in her writing and in her lessons. Peace is found on three levels in the Montessori early childhood classroom: Global, Classroom, and Inner. I'm reading this wonderful book called Nurturing the Spirit: In Non-Sectarian Classrooms and thought I'd share a few ideas about cultivating stillness that you can integrate into your home and your classroom. This post will be part of a series on how to integrate peace in your home. Position Cards These cards are meant to be used individually by the child. I am hoping to find a moment to make our own cards but in the meantime, I am planning to use these Yoga cards as a start. Each card exhibits an image of a child in a position that illustrates care and reverence. So, for example, the book describes love, caring, giving and receiving positions. The image could be of a child cradling a baby to indicate caring or cupping his hands to indicate receiving, for example. The idea is for the child to choose a card and to remain still by imitating the position for a minute before moving onto another card. I like the idea of asking the child how he felt while in the position after the work is complete. Quiet Corner One of my favorites and very simple to integrate into your home and classroom, this reading corner is different than a reading nook.. This space is meant for observation in silence. So you can include a plant for caressing, a fish tank for watching or simply a window for staring. I recently purchased a Cretan's Labyrinth to place in our work-in-progress quiet area. Outdoor Quiet Space I adore the idea of creating space outdoors for a child. Fresh air works wonders for calming. In a space that allows you to see him, place a small chair, maybe include a blanket in the chillier seasons. A wind chime may also provide a wonderful calming effect. If you can create a shelter or an arch, that would create more of a cozy, safe feeling, very inviting to the child. This space is meant for the child to be alone. Thank you for choosing to read this post today. I hope that we inspired you.